Fortunately though, this latest “episode” of the film franchise stands out as an energetic entry that is so packed with action and humor that it’s hard not to enjoy it. In addition to this being the 13th entry in the film series, 2016 marks the 50th anniversary of Star Trek. In 1966, the original show — starring William Shatner and Leonard Nimoy — began airing. Created by Gene Roddenberry, the franchise has thrived over the ensuing five decades with some tremendous high points and a few low ones but Star Trek Beyond proves that this series still can offer a few great surprises. In this new installment, the crew of the USS Enterprise is tasked with rescuing a crew that was stranded on a distant planet. The Enterprise is chosen because it can navigate the treacherous Nebula system but that system is the least of their problems. The ship is attacked by a violent army led by the commanding Krall (Idris Elba). That assault leaves the crew members stranded and isolated from the Federation. The script, which was co-written by Simon Pegg and Doug Jung, sets up the situation nicely pairing the crew members up on this isolated planet. Captain Kirk pairs up with the earnest Chekov (the late Anton Yelchin). Commander Spock (Zachary Quinto) partners with the sarcastic Bones McCoy (Karl Urban). 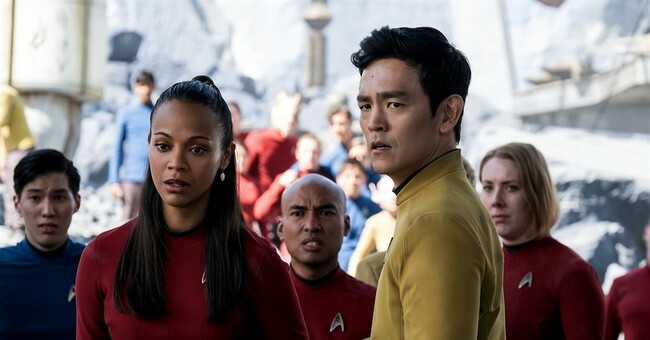 The noble Sulu (John Cho) pairs up with the tough-minded Lieutenant Uhura (Zoe Saldana) but the best match-up might be Scotty (Pegg), who is paired up with Jaylah (Sofia Boutella), a tough-as-nails warrior who saves Scotty’s life and eventually helps him reunite with his colleagues. The pairings though provide these characters a chance to develop their personalities with several of them sharing great moments together. In their respective journeys, many of them learn from their colleagues in heartfelt quieter moments that keep the characters at center stage. These personal relationships help set the stage for the action sequences that are to come and there are plenty of them here. The overall depiction of the action works well but director Justin Lin (who previously helmed Fast 5 and Fast & Furious 6) sometimes uses a frantic pace to show key moments of these sequences. The action could’ve felt more cohesive if the camera wasn’t moving around so much. That being said, some of the effects showing the Enterprise being attacked and the ones featured in the climactic action sequence are superb. As the newest entry in the series, the feature doesn’t take as many risks as the Star Trek reboot or Star Trek: Into Darkness. The writers here simply know how to create a solid story — with a compelling villain — that functions commendably in this universe while reminding viewers why these characters continue to be so compelling. Star Trek Beyond easily completes its mission as a fun and energetic sequel that will keep the audience entertained and thrilled during its 120-minute running time. Click for more must-read reviews of the new Star Trek film.